I started reading the first Harry Potter book back in 1998 or 1999, when it came to the US, and I loved it. The last book, Harry Potter and the Deathly Hallows, was released in 2007, and Harry Potter and the Deathly Hallows Part 1 was released in theaters near the end of last year. The movie we've all been waiting for, however - the climactic end to the series, and to an era, really - was this one, Harry Potter and the Deathly Hallows Part 2, and it definitely does not disappoint. The other films in the series gave a bit of background information on the characters, but DH Part 2 skips all that, immediately picking up where the last movie left off: Lord Voldemort (Ralph Fiennes) is in possession of the Elder Wand, which makes whomever owns it the most powerful wizard in the world. Meanwhile, Harry (Daniel Radcliffe), Hermione (Emma Watson), and Ron (Rupert Grint) are still at the beach house where Dobby died, looking for Horcruxes. They think that the final Horcruxes will be at Hogwarts, so they return there, to find a grim situation afoot: the dour Professor Snape (Alan Rickman) is currently headmaster, and the students are often "disciplined" (or beaten) for disobeying the rules. Voldemort soon finds out that Harry has returned, and the fight to the death begins. Yes, definitely see this movie. I have many likes and a few dislikes about the movie (more likes than dislikes) ... this paragraph is going to have a few spoilers in it, so if you haven't read the books, you may want to skip it. I loved how it kept true to the book, for the most part, and the scenes between Voldemort, Harry, and Snape, especially, are riveting. There's a flashback section after (SPOILER) Snape dies, which is one of the strongest parts of the movie, showing what his true intentions toward Harry were all along. The fight scenes at Hogwarts are extraordinary, but I felt that deaths of some of the more-than-minor characters (for example, Ron's brother Fred) were glossed over, though they were still included in the movie. DH Part 2 clocks in at 2 hours and 10 minutes, which is shorter than most of the Potter films, and they could have made it a little longer, but the length overall was fine. The 3D was very good and I would recommend seeing it in 3D if you can; if not, the story is riveting enough that you probably won't miss it. I wish the movie could have given more screen time to the smaller characters we have grown to love and hate, like Neville Longbottom and Bellatrix Lestrange, but the focus of the movie is on Harry and Voldemort, and the journey they have gone through together, so I can see why they didn't. At the end of this movie you're going to want to re-read all 7 books and watch the first 7 movies again - I actually just ordered DH Part 1 on DVD, since I have the first 6 in a box set - because you're going to miss Hogwarts, Harry, and his friends. 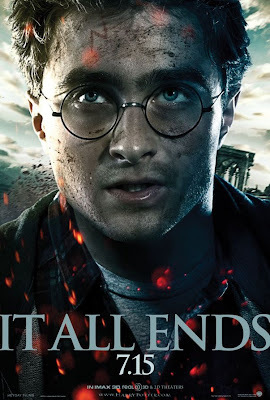 The movie's tagline is "It All Ends," and DH Part 2 is a fitting end to a spectacular series that has captured the attention of readers and moviegoers all over the world for the past 10+ years. We will miss you, Harry Potter. Harry Potter and the Deathly Hallows Part 2 is in theaters today, July 15th.